Since the early days of the Cyberpunk pen-and-paper role-playing setting, I've been fascinated by the idea of highly-skilled computer hackers roaming the plains of cyberspace looking for a fight; digital cowboys with their fingers twitching inches away from their plastic 101-shooters. The realization that real hackers are just normal people tapping away at standard keyboards was something of a letdown. I'd like to think PWN: Combat Hacking is what their mind's eyes see when they're staring intently at boring strands of glowing text. Now I'm not saying Erik Asmussen's iOS game is anywhere close to an accurate representation of two security experts engaged in an electronic dogfight deep within the servers of a major corporation. It's just the way I like to imagine it. No rave lights, no Cookie Monster Virus — just a series of nodes to be divided and conquered. The concept is simple — eliminate the competition by taking over nodes, removing their influence from the server. Both sides start with one node to launch from. Tapping on an adjacent node slowly takes it over. 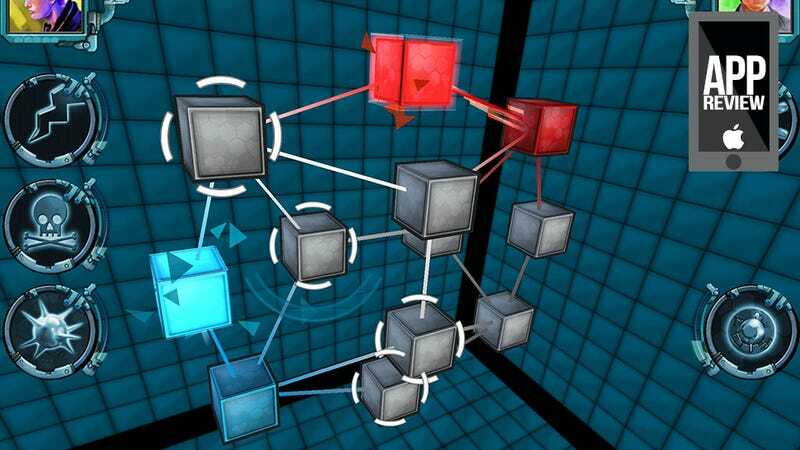 The more nodes you control that are connected to an enemy node, the faster they are taken. As the campaign progresses power-ups are unlocked, timed tools that give players an edge on the competition. Viruses take over enemy nodes. Scanners heal your nodes and reveal any trojans the enemy may have placed. Lock a group of your opponent's nodes for a brief period, stalling their advance while you make your move. Every unlocked power-up ups the strategy factor. Where PWN: Combat Hacking really shines is multiplayer. It's sadly Bluetooth-only, but when you hook up with a skilled live opponent and the trash-talk begins to fly the experience is simply exquisite. Such tension, such drama — it's just perfect. It's not hacking — corporations would be ill-advised to make their security system play like a strategy board game — but PWN: Combat Hacking is what I want hacking to be.